The next tropical storm from the Atlantic this season to threaten land, Tropical Storm Chris, is approaching the Leeward Islands of the Caribbean and the Bahamas. Fortunately, it isn't currently forecasted for hurricane strength. 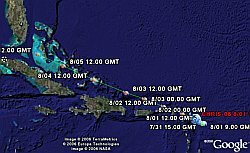 You can track Chris and other tropical storms around the world using Google Earth and the excellent Hurricane Tracker posted by 'glooton' at the Google Earth Community. 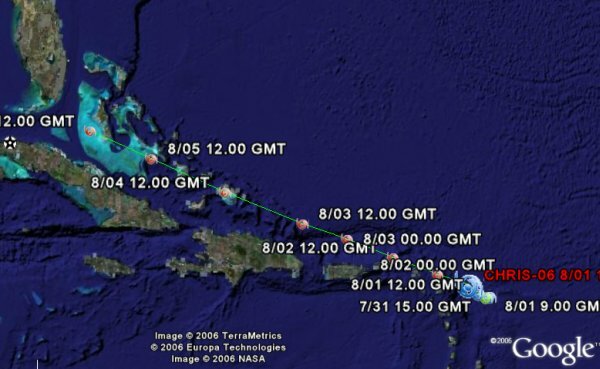 Or, better yet, check out the Google Earth Blog storm tracking tools network link which bundles the tracker and other weather tools. These tools let you overlay satellite photos and other data in Google Earth to see the positions of storms, radar weather and other weather conditions.